Warby Parker does it again. More specifically, its founder Jeff Raider, does it. Yesterday, he opened The Corner Shop, described as the "modern neighborhood barber," over at NYC's MacDougal street. The shop offers haircutting and shaving services along with plethora of locally sourced products like pajamas, toolboxes, notebookes and other things needed by a modern man who likes to be well-groomed. The Corner Shop is a real-world embodiment of an e-commerce site named Harry's, where one can buy everything mentioned above. The Shop aims to offer the full grooming experience that Harry's hopes to become synonymous with. To get there, it adheres to the same principles of social responsibility and locally produced, artisanal products. The Corner Shop is a destination where one can not only buy products, but learn from master craftsmen how to use them, too. This model, "build online, then build offline" seems to be working great. But the core of Warby Parker's, and now Harry's, innovation isn't only this model. It is the ability to achieve wide market reach while cutting out the pricey middlemen - be it resellers, wholesellers or expensive mass-market shaving gadgetry - from its value chain. Failing eyesight is a simple need. Shaving is a simple job. Knowing how to do it well shouldn't be expensive, only fun. Best solutions to social and economic problems are those that don't require any behavioral change. The Spring is exactly such a solution. This app provides a monetary incentive for people to eat at places that support local community projects. More specifically, The Spring gives diners 3% cash back and 3% of the bill donated to a project supported by a restaurant. Best part of this dynamics is that it utilizes the already existing behavior of a person choosing a restaurant. They just provide a frame for customers to make this choice in a way that maximizes their social and monetary gain (feel good + 3% off dinner). The mechanism of seamless donation that the app supports is equally simple. It boils down to four steps: 1. register your credit card info on The Spring's website, 2. download the app, 3. select the local restaurants doing social good and 4. opt-in for alerts about supported social initiatives. This sort of creating a positive social impact by using the simple principles of behavioral economics is something that was hard to do before digital media. But now, we have no excuse to bail out. Patagoria remains consistent with its focus on sustainability. Thoroughly aligned with the values of its customers, Patagonia has already unleashed their Common Threads Initiative (an eBay program where Patagonia customers can sell their Patagonia stuff) and number of ads advising against conspicuous consumption. 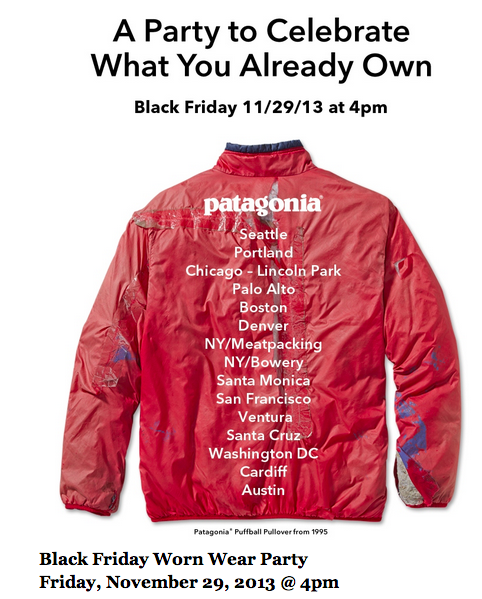 This year, from Patagonia comes with Worn Wear initiative, launched just before the notorious Black Friday. The title of the campaign is "The Stories We Wear," which is meant to remind us that clothes we already own become only more valuable with time, as they become part of the narrative of our life. The campaign is taking place in 14 US cities (and at two places in New York City) and features a movie "Worn Wear," a repair clinic, limited-edition beer, life music and food. With WishList Granted, your friends can now contribute to things you really, really want for Christmas. It's like Kickstarter, but for Christmas gifts. This is wonderful - and it would be even more wonderful if brands partnered with Amazon to make sure economically disadvantaged people get their wishes fulfilled. Or, if we could do the same thing we would do for our friends to some kid who needs it more. More from the department of wearable technology: welcome FiLIP, potentially parents' new best friend when it comes to their kids' outdoor activities. FiLIP is a wearable smart locator and phone for kids. Kids can wear it on their wrist like a watch, and parents can know at EVERY CONCEIVABLE MINUTE where their kids are and send them text messages. The device is also equipped with five pre-set phone numbers for a kid to dial if the need arises. In addition to real-time location information and text messaging, FiLIP sends notifications to parents if their kids leaves a designated safe zone, like playground. This is pretty smart, even if it doesn't entirely solves the challenge of kid's supervision. You can see more here and get one for your kid here. Saks Fifth Avenue is pretty famous to NYC visitors for its holiday window display. So famous, in fact, that there are crowds lining up to see it and that its unveiling is an event. This year, Saks decided to bring its window display to its customers. This premium department store created a video of the holiday display launch moment and the full program (while I am not a fan of this sort of entertainment, some parts of it are pretty good). Some parts of the entire video-launches-in-another-pop-up experience are definitely clunky, but the idea of bringing a small piece of luxury to consumers is valid. Smart part is adding product recommendations together with the video, so inspired customers can turn to transaction immediately. A great example of content & commerce combo. Keep innovating, Amsterdam. Source: Collaborative Consumption. "The stories and legends of the great end-ups that inspire most great start-ups – think of HP, Apple, IBM"
"End-ups have learned to manage scale, and have accumulated wisdom over time; start-ups have the benefit of the agile beginner’s mind. The challenge for both is to seek greatness by learning from each other." A great John Maeda read. "We have to innovate innovation itself." "Why are we funding these really silly internet companies and not major life changing innovations? Why is it that all of my peers are inventing little dinky iPhone apps instead of planes, trains, and automobiles? I feel like this is a really important question. Because, if as a country, America is going to continue to lead in innovation, we can’t be spending our time developing toys. We have to innovate innovation itself. In fact, I’m actually not the first person to bring this up. There are a lot of thinkers surrounding the entrepreneurial space who have been asking this same question: Why are so many startups today creating such meaningless products?" See the rest of this excellent read here. One more thing from the digital enthography department. Read Amazon reviews, and read them carefully, as that's apparently quite a lucrative business. FC has recently written about a mysterious company named C&A Marketing which does exactly that. They have an entire team who read Amazon reviews, screening them for comments like "I wish this speaker were rechargeable," and then makes exactly that. For those less entrepreneurial, it still provides a goldmine of ideas and inspiration. How does it work? Well, pick some brand's product and also pick competitors products. Read what people are saying about what works. More importantly, read what they are saying about what doesn't work. Build your strategy around it. In this age of digital visibility, planners don't need anymore to wreck their heads to come up with a competition/brand/product/category thesis and then do everything in their power to prove it. They can merely generate a hypothesis and turn to a load of visible, human, freely volunteered information to either confirm it or not. Planners, rejoice. Here's the new spiffy tool to quickly find out what people are saying about a brand across social media platforms (the engine searches Twitter, Instagram, Tumblr, Facebook, Vimeo and Flickr), what kind of content they are associating with a brand and what's the context of the brand mentions. All in one place. I'm a fan. I came again across Clayton Christiansen's pattern of industry disruption this afteroon while reading some article. Christiansen summarizes this pattern via three simple steps (I advise writing them down or else remembering them). 1. New competitors with new business models arrive. 2. Incumbents choose to ignore the new players or to flee to higher-margin activities. 3. A disrupter whose product was once barely good enough achieves a level of quality acceptable to the broad middle of the market, undermining the position of longtime leaders and often causing the "flip" to a new basis of competition. Applied to AirBnB as a distruptor and the hotels as the incumbents in the hospitality industry, these three steps look as follows. 1. New competitors with new business models arrive. AirBnB's innovative business model revolves around creating a platform that connects supply of available accomodation and demand for this accomodation in a new way (by defining available accomodation in terms of people's owned or rented properties), and collecting a fee in the process. 2. Incumbents choose to ignore the new players or to flee to higher-margin activities. Major industry players like dismissed AirBnB and sometimes even say things like this: "Quite honestly, I had to google what [Airbnb] actually means, which shows you how much we pay attention to it," "It's a gnat on the dog's tuchus. "It might itch, but it's not a game changer" and "I think it’s serving people who didn’t travel because they were scared, or couldn’t afford it, or use it because it’s an antidote to loneliness." 3. A disrupter whose product was once barely good enough achieves a level of quality acceptable to the broad middle of the market, undermining the position of longtime leaders and often causing the "flip" to a new basis of competition. AirBnB has recently hired founder of the Joie de Vivre boutique hotel chain, Chip Conley, as its Global Head of Hospitality and Gowalla's co-founder to joing their mobile team. AirBnB today has more than 10 milion nights booked and there is a rumor of a $2.5 bilion valuation. The start-up is expected to overake both Hilton Worldwide and InterContinental Hotels Group in 2014 as the world's largest hotelier. Take that. Utility wins. Utility always wins. GAP has recently unveiled its "Reserve" program, allowing shoppers to place a claim on a piece of clothing online, and pick it up in store. Right now, the program is in its pilot stage, with only selected stores participating. Once it becomes a standard practice, however, it will probably prove to be a successful way to counter the ever-growing practice of showrooming. There is a ton of other benefits, too. The program reduces the risk of online shopping, which is still a factor in online purchases, despite numerous product exploration tools. Users can simply try on their selected item at a nearby store. The program also drives shoppers to store, where they will continue browsing, and very likely, add items to their purchase. Finally, there is a big element of exclusivity and good customer service. The "Reserve" program, above all, makes things more seamless for the user - ensuring their brand affinity and loyalty. I find it interesting that best innovation in retail comes from mass retailers (think H&M and Target collaborations, Walmart's Lab, Zara's monthly catch-it-or-its-gone trends, or Macy's recent introduction of Shopkick) vs. premium and luxury ones. It's the matter of incentives. But, the more affluent people have, the more money's to be made on the less affluent ones. There's more of them, too, anyway. Or, more precisely the Multi-pass will be coming to your town in 2015. This all-your-transportation-in-one-place is the latest in the trend towards end-user consolidation of services. From travel (Kayak) to banking (Coin), innovation revolves around aggregating multiple information streams into a sleek, clean, easy-to-use interface human-facing interface. In its best form, this is reduction of complication, while keeping complexity of the system intact. 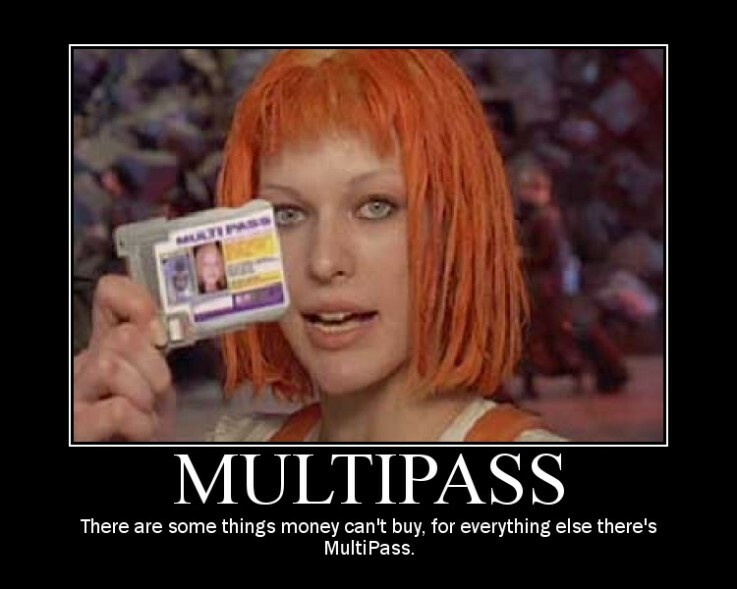 The idea behind Multi-pass is to fold in one single ticket your train, metro, bus, car parking and possibly air passes (think the Fifth Element situation). Everything that has to do with moving a person from point A to point B now is in a single ticket. The secret is in e-ink screen, that displays barcodes for relevant transportation operators to scan and let you go through. Let's just enjoy this idea for a moment before starting to think about all the challenges that it's bring for our privacy. This app is pretty smart, and it comes from the "how to make people's lives better in a way that makes sense and that doesn't make them consume more stuff" department. Su Chef is an app that helps random/busy/untalented/uninterested food shoppers combine the random food they just purchased into something non-random, a.k.a. a meal. At the core of the app is the filtering mechanism that scouts through millions of recipes by criteria of the available food, allergies that one may have, or a key ingredient. As always, systemic serendipity leads to learning, so I wouldn't be surprised if the app gets to unlock some kitchen creativity even among the most disinterested users. Innovation is not about making new things, it's about making better connections among the things that are already out there. Get your Su Chef here. Last week, Pinterest decided that it's time to make its pinboards into something with a more of the geo-location relevance. This new "map," made out of photos and reviews and images and information in the form of Place Pins, works like this. Users can create boards around a specific location or with a specific theme in mind (think along the lines of Fourqsquare's "Best Martinis in NYC" lists) and whatever information they place pin in on the board gets displayed on the map. Hey, isn't this a nice way to share your recent trip to Mexico City? Equally nice is exploring the city you were just about to go to, all in one place. This is quite a nice addition to users' online planning process, where quest for inspiration and location-related information beats all other steps in the funnel. More interesting to me, however, are the partnership opportunities that place pins offer. As of now, Pinterest banded up with Foursquare to use its API (Foursuare allows users lists and also shows them on the map, but information is limited to photos and reviews) and Mapbox, which provided the maps. In the works are partnerships with Disney, BBC Travel, Conde Nast Traveler and the load of other travel-related publications and hotels. Four Seasons, for example, has pulled its Foursquare reviews and photos and turned them into place pins for its "Gastronomic Travel" board. You can check it out here. Conde Nast traveler, on the other hand, pulls info directly from its magazine for its "Top 100 Hotels in the World" list. Fun times will start when place pinboards get to be embeddable, so all the above mentioned partners can display thematic itineraries on their own sites. I am curious to explore all the new maps over the territory, fueled by the great content and a lot of existing user activity. Can see them being quite useful. Grant McCracken is running an essay contest, starting today at 2pm over at his site. The topic is juicy: Kim Kardashian and Lena Dunham, Compare, contrast, explain. "Who are Kim Kardashian and Lena Dunham? As young American celebrities, they are conspicuous parts of popular culture. They express trends already in motion “out there.” This makes them cultural “effects.” But they also shape and clarify things that are beginning to emerge. This makes them cultural 'causes.' Who are these women and what do they say about our life and times? What are the causes (trends, events, developments) of which they are effects? And what are the effects (trends, events, developments) of which they are causes? What shaped them, what are they shaping? Review them, please. At the very least we are looking at very different visions of femaleness. Give us the what and the how. And the why." And you can win a Minerva prize and statue! Don't wait for 2pm, start now. TOMS is a company based on a simple exchange: buy a pair of this brand's shoes or glasses, and the company gives a pair of the same to kids who need them. For a long time, TOMS was an example of a sustainable brand that combines a viable business model with social consciousness. The brand itself accumulated significant equity in the process: wearing a pair of TOMS shoes means that you are a responsible, caring consumer who puts benefits of others over their own vanity. Now, TOMS upped the ante on giving back. The brand recently launched TOMS Marketplace, a platform for social entrepreneours to promote and sell their environmentally conscious, sustainable goods. Yes, this effectively means that a brand sells other brands under its turf. The thread that makes this actually make sense is the unifying mission between the TOMS brand one one side and all those emerging entrepreneurs and the goods they are selling on the other. The more TOMS can unite other companies under its mission of giving, and the more ways to give it can find, the stronger its own brand becomes. Simple. As of now, TOMS Marketplace features about 200 products from 30 companies. Products range from jewelry to tech, home hoods and accessories. Best part is, one can search by the region, product, cause or brand. Check it out, each listing includes a story and the social impact of the company, and there are some cool product curations by TOMS founders, too. Michael Kors loves Instagram so much that it became the first brand to advertise there. And Instagram loves it back. Barely a day and a half after debuting its sponsored pic (above), Kors' Instagram account acquire about 34K new followers. After crunching some numbers, this means that a single sponsored post gained 16x more followers than a regular one. This should be such a shocker, regarding the fact that sponsored posts are seen by people who do not already follow @michaelkors on Instagram so gaining followers is easier than exposing the already existing fan base to brand content, but there you have it. The budding love affair between this fashion brand and the photo sharing platform didn't stop there, it should be noted. It continued in the elegant halls of the Tokyo National Museum, where Mr. Kors' promotional campaign for the Selma bag reached its glamourous ending on November 13. So, in Tokyo National Museum, these photos were projected in the kaleidoscopic format, mixing locations, lifestyles, and different ways to wear a bag. Not to be forgotten, images were also printed and displayed on the museum walls. Twitter, next digital commerce platform? There's a new partnership in town. Twitter and Starbucks joined their forces to enable users to gift each other Starbucks coffee via tweets. Bestowing a $5 latte on someone has never been easier. One just needs to include @tweetacoffee and the recipient's Twitter handle in their tweet, and the above mentioned latte is on its way either through adding the gift amount to the Starbucks card or printing the eGift. Twitter has already proven in its partnership with Amex that it can be a quite robust digital commerce platform. Starbucks partnership takes this premise further. It is not hard to imagine how Twitter can evolve from current deals & discounts to gifting and to actual monetary exchanges. The critical advantage that Twitter has as a platform is a load of existing social relationships and content, both of which are highly coveted context for online transactions. The mechanism seems simple enough, and it will only get simpler. Neither technology nor user behaviors are a barrier here; it's the retailers that are slow-moving. Move over, Nike Fuel, you are not good looking enough. From Google Glasses, through Fitbit Flex to Sleep bracelets, we are extending our minds and bodies. Looking good while doing so has never priority for our networked, cyborg-ed selves. That is, until now. Coming under the name of MEMI is a silvery, pretty, goes-with-everything bracelet that discreetly lets its female owner know when someone important is calling their cellphone. Subtle vibration of the bracelet is enabled by bluetooth connection with a smartphone. More than MEMI's particular functionality, it's its foray into fashion market that makes it newsworthy. Imagine if a fashion brand added a Nike Fuel to their next line of accessories, and made it out of bespoke, customizable leather made in Italy. While leather actually may not work for a sweaty wrist, the idea can be applicable to Sleep bracelets. It's not like this hasn't happened before. Google Plus has already tapped into Warby Parker designs for their Google Glass. But the ball is now in the court of fashion brands, who only too well know the "what's next" and "i want to be first" sensibilities of their customers. It's time for fashion brand to get techy. There's an enormous market waiting. Not so unnecessary, after all. Phillippe Starck is staying true to his word. Some years back, Starck famously declared that designers of the future are "a personal coach, the gym trainer, the diet consultant." In other words, people who deliver utility. He didn't stop there, though. He started pursuing a new, democratic, accessible design approach, the one that's made for sustainable environmental impact rather than for the pleasure of the priviledged few. The city of Bordeaux needed a bike sharing program. Peugeout and Starck partnered to help. They created a fancy - and functional - combination between a scooter and a bike, great for both the light cruising and for the heavy pedaling. As for the bike/scooter design process itself, it was democratic. Starck solicited suggestions from residents of Bordeaux and incorporated them in his design concepts. 20 volunteers are now testing the bikes, and will send their feedback. The Pribal bike sharing program is set to start in January 2014. More importantly, Phillippe Starck can't claim anymore that "everything he's ever designed is absolutely unnecessary." Can we be PiePals please? So far, now only pizzas you can order are by Domino's. PiePal creators reverse-engineered Domino's ordering system and included features like locating the nearest store and tracking the order. You can sign up to be a beta-tester here. In his "The Work of Art in the Age of Mechanical Reproduction," Walter Benjamin lamented loss of art's appeal due to infinite reproducibility of photography. The time was early 20th century and the promise of mechanization enticed and mesmerized humanity. It only made sense that its enormous potential was, for some, the jeopardy for originality. In its place, we got entertainment industry, consumerism, kitsch and mass culture. Rewind to Canada, circa 2013, and ask what happens when an ad agency gets its hands on a 3D printer? As the unavidable British accent (this is advertising, after all) in the promotional video states, "3D printer allows us to bring any object to life with a click of a mouse." Indeed. Yet, faced with abundance of human life-improving options, what does an ad agency do with its treasured, rather pricey, possession? It starts printing advertising awards. To be more precise, 800 gold Cannes Lions and 194 One Show's Silver Pencils. The official story is that this is a stunt to promote a local ad show. The unofficial story can be easily interpreted either as a serious case of award envy or yet another proof of ad industry's egocentrism. Or, most likely, both. But I am not interested in the whereabouts of Canadian ad agencies. I wonder what happens with the award-winning work in the age of 3-D reproduction, to paraphrase Benjamin. Cannes Lions are not exactly objects of art, although some would definitely deem the rewarded work as such. Reproduction of a symbolic object takes away that privilege. But it's not about the awards, even if their commoditization ruffles our feathers. Truth to be told, ad award have already lost so much of its allure so it's not like reproducing them can be deemed responsible for that. It's about the values, and this little Canadian agency inadvertedly throws it into our faces. 3-D printing is the doman of The Maker: a domain of solving problems like word hunger, infant mortality in the third world, and sustainable energy. It's created by The Maker, for The Makers. With each printed objects, this technology spreads values of humanity, collaboration, democracy and progress. Advertising awards are reflection of the values of entertainment, consumerism, kitsch and mass culture. To 3-D print a Cannes Lion, and a gold one in that, is to crush these values. That's why it's so bothersome to the industry. Our optimism about 3-D printing is the same the optimism that spread through the early 20th century with mechanization. It's only natural that someone's going to show up and point out how it eats away at our values. In this case, it's a good thing. From the project "The Comfort Zone" by photographer Tadao Cern. Italy is famous for many things, but high-speed Internet isn't one of them. To believe that fast Internet is possible in Italy, it may actually need imagining that you are somewhere else. And that's precisely what Fastweb, Italian telecom company has done. To show how their speedy broadband compares to that of Tokyo, it turned the entire Milan train stop into Tokyo's Shibuya. In this elaborate stunt, the station became equipped with everything from Japanese newspaper kiosks, teenagers and screens streaming Japanese programming. The shock of Italians stepping out of train into this faux-Shibuya is probably going to commensurate with their surprise of having the faster web. Lady Gaga has proven herself to be an excellent engagement planner. To promote her upcoming album, ARTPOP, the pop-icon turned to her most abundant resource: her fans. Carefully cultivated over years, Lady Gaga's relationship with her fans is notorious. She affectionately calls them Little Monsters and often personally responds to their notes. This summer, the fans took the promotional matters into their own hands. This meant everything from crafting album flyers to a YouTube show called Radio ARTPOP, which revolved around discussing the upcoming album. And that where her majesty herself comes in. Tapping into 1% of her audience (which measures 40 million Twitter fans and 60 million Facebook fans), Lady Gaga employed the "Accidental Influentials" approach based on "influencing easily influenced individuals who influence other easily influenced people." Namely, she did what a smart engagement planner would recommend. She invited moderators of her Gaga Daily website "into the brand," i.e. to hang out with her closest entourage; she used UGC platform to spread the word, by leaking parts of her album on Radio ARTPOP and promoting the channel on Twitter; and she promised the first sneak-peek to a selected few of her final selection of songs to be included in the ARTPOP album. All of this comes from the first truth of engagement planning: know thy audience. She nailed it. In other Instagram news, a Brazilian artist placed transparent filters, not unlike those that Instagram uses (think EarlyBird or Hefe), at London's most popular tourist destinations. People can take photos through them. Or, they can just use Instagram. Make no mistake, this invention couldn't have easily emerged anywhere but in China. For some years now, it's been widely known that Chinese painters are excellent in creating reproductions of paintings. They are incredibly meticulous and work fast. There's an entire industry created around this speed and meticulousness. But now, the digital and physical world collided and expanded the definition of what a coveted object of a reproduction may be. Would you like that Instagram photo you are so proud turned into an oil painting? No problem, Pixelist can do that. Pixelist is a start-up founded by an American who ended up in China in 2005, and never returned. With a good reason, in that: he managed to spot the right need in the digital photo market and the right opportunity in the abundance of Chinese painters very skilled at reproductions. Just like that, the custom-made oil paintings once available to the selected few are now within the mass reach. As of now, Pixelist has reached and surpassed its funding goal on Indiegogo. Still debating whether to order something. Never to be the one not to innovate, Toyota came up with the concept "car" around the idea of mimicking the symbiosis between the rider and the horse. Similar as with the horseback riding, drivers of the new Toyota vehicle can steer it by simple shifting of their their body weight. Driving a car becomes an intuitive and not a learned task. Gestural interface is augmented by voice and facial recognition sensors that provide all the possible driving assistance, like destinations, distances and other data. This information is presented in real-time on a windscreen, augmented reality style. Toyota's innovation comes at the heels of the fact that the next generations of would-be drivers can't - or don't want to - afford the costs associated with the cars, their maintenance and insurance. Environmental issues are another concern among the millennials, as is their pervasive perception that cars are an old-fashioned technology. While Toyota's FV2 is still in the experimental stage, it may offer a sustainable alternative to all the objections above. After all, this automaker was the one who first introduced the idea of a hybrid vehicle back in the late 70's. In this case, FV2 may show that the future of transportation can, after all, turn out to be faster horses. ... "You wouldn't care about what other people thought about you if you realized how seldom they actually did." From: "The Spotlight Effect" and "The Spotlight Effect in Social Judgment"
I Can Haz UberKITTENS is a pretty amazing idea on so many levels. To celebrate National Cat Day (and to drive awareness and downloads of its app, cough cough), Uber partnered with Cheezburger site to deliver kittens to your doorstep. For 15 minutes, the kittens are yours to cuddle and play with. Then off the Uber driver goes to the next destination. A pretty neat idea that benefits both the Uber, as it promotes its service, and forCheezburger network, an online content platform that entered the Internet Hall of Fame for its cat memes of unlimited variety. The promo was priced at $20 and the money was donated to NYC, SF and Seattle's animal shelters. The kittens were also available for adoption, if you were feeling inspired. Smart & business savvy PR stunt. Practicing behavioral science or helping you find a sugar daddy? most likely, both. It's true that any publicity is good publicity, and newly launched Carrot Dating app knows a thing or two about public outrage. The app doesn't even try to disguise the main social dynamics it offers to people who are looking for a date or, just for a nice dinner at a fancy restaurant. It's premise is simple: let's not pretend that dating is all about good looks and the ever-elusive chemistry. Most of us don't mind a bit of bonus features, too. Carrot made those "bonus features" the crux of its dating platform. Instead of displaying your six pack or your interest in digital anthropology or the books you read on weekends, the app prompts you to actually pay up for a date. The exchange is simple: offer a dinner, a movie, a concert ticket or something equaly tangible, and the date is yours. That is, if she or he chooses your offerings. This is old school barter, brought back by design. You are what you have, and far from being a shocking poster child of digital culture, it's actually a new playinground for creativity. Just like How About We dating app lets its users come up with the fun ideas for the first date, Carrot Dating does the same: it let's you express yourself through what you are willing to pay for. In the time of the sharing economy, paying forward, and creating new ways to connect abundant demand and scarce supply, Carrot Dating may be seen just as another form of generosity enabled by digital media. After all, random generosity breeds serendipity, and serendipity may lead to love. An ad made an unexpected turn on the Wired site. It announced Wired partnering with Absolut to sponsor #TransformToday, a contest where Wired readers are invited to submit their dream text project for a chance to work on it with the "WIRED Insider." Nothing new, surely, but what is Absolut doing there? Alcohol and innovation anyone? The unsurprising truth being is that for Absolut this is nothing more than advertising, per usual. Still, brands can take cue: there are a lot of worthwhile causes and a lot of ways to make people's lives better, and if a brand's spending money on advertising, might as well chip in on a meaningful initiative, like endearing vodka to emerging tech entrepreneurs.